I’m Kristin Osborn, an author, educator, and clinician with a research background at Harvard Medical School. I co-wrote the book Paraverbal Communication in Psychotherapy: Beyond the Words to teach clinicians the value of videotaping their sessions as a way to improve their practice. I’m a seasoned presenter and educator who enjoys designing training experiences that fit the needs of my audience. A day at one of my workshops may include video segments of psychotherapy sessions or role plays, interactive exercises, live demonstrations, and worksheets that attendees can use to enhance their professional development. My mission is to inspire healthcare and wellness professionals to cultivate an authentic presence both inside and outside of their sessions. I accomplish this with specific steps to help improve their self-assessment, incorporate client, peer and supervisor feedback, and prepare for a lifetime of deliberate practice. What sets me apart from other educators is my focus on the emotional wellness of trainees and my emphasis on the importance of self-care, self-compassion and resolving emotional conflicts. Want to work with me? I’d love to talk, here’s a way to get in touch! Affect Phobia Therapy is based on the premise that internal conflicts about feelings underlie most psychologically-based disorders. Affect Phobia Therapy is an integrative model of short term dynamic psychotherapy (STDP) that was developed by Harvard Medical School psychologist and researcher, Leigh McCullough (McCullough-Valiant, 1997). Affect Phobia Therapy integrates techniques from psychodynamic, cognitive-behavioral, and experiential therapies into a powerful whole that can increase the effectiveness of therapy and help it to proceed more rapidly. Affects (the technical term for feelings or emotions) are the strongest motivators of human behavior. Affects can motivate healthy, adaptive behavior and they can also lead to unhealthy, maladaptive behavior. By: Kristin A. R. Osborn & Dr. Maneet Bhatia, Ph.D.
Paraverbal Communication in Psychotherapy: Beyond the Words delves into the world of nonverbal cues that are ubiquitous in our lives and particularly revealing in therapeutic practice. Building upon the research of Daniel Stern, Beatrice Beebe, and others, the authors explore the specific manner in which patient and therapist interchange para-verbally in psychotherapy. 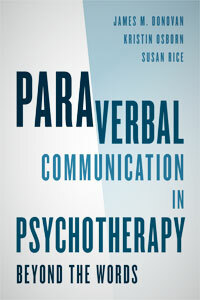 The authors examine the history of and current trends in dynamic psychotherapy and discuss the tools and procedure for analyzing para-verbal communication. By reviewing engaging case studies from their own practices, the authors step through how therapists and clinicians can capture non-verbal signs like facial expression, tone of voice, or posture in their own sessions. By examining both client and therapist, practitioners can discover insights into their own techniques, how they engage with clients, and how to anticipate significant changes in treatment based on preverbal exchanges. Paraverbal Communiction in Psychotherapy navigates the web of unspoken communication to create an innovative approach to psychotherapy and a valuable tool for practitioners and those in training.